Subsequent investigations have shown that the stresses within the crack tip region are lower than the elastic stresses and that the size of the plastic deformation zone in advance of the crack is between ry and 2ry. Models of an elastic, perfectly plastic material have shown that the material outside the plastic zone is stressed as if the crack were centered in the plastic zone. 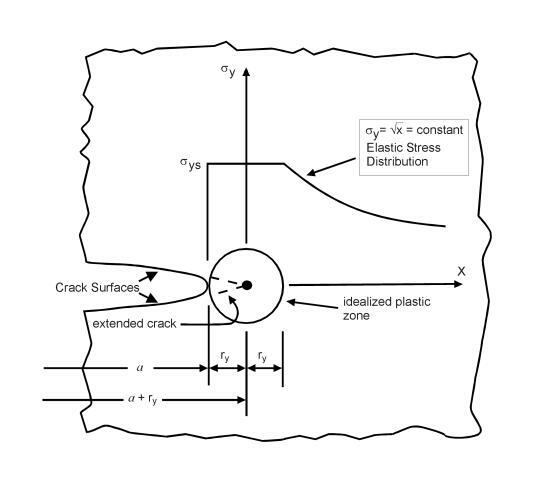 Figure 2.2.5 describes a schematic model of the plastic zone and the stresses ahead of the crack tip. Note that the real crack is blunted as a result of plastic deformation. If the extent of the plastic zone as estimated by Equation 2.2.5 is small with respect to features of the structural geometry and to the physical length of the crack, linear elastic fracture mechanics analyses apply. Sometimes, the concept of contained yielding, as illustrated in Figure 2.2.5, is referred to as small scale yielding. Most structural problems of interest to the aerospace community can be characterized by linear elastic fracture mechanics parameters because the extent of yielding is contained within a small region around the crack tip.